MMA outshined his WCS EU Finals Day 1 performance on Day 2. I am extremely impressed by his openings and details. His style is refreshing since I’m getting bored with INnoVation’s TvZ. MMA did not just talk the talk, he also walked the walk. MMA planned his game very well. He opened up with 12/12 Reaper expand, and harassed VortiX with the first Reaper. 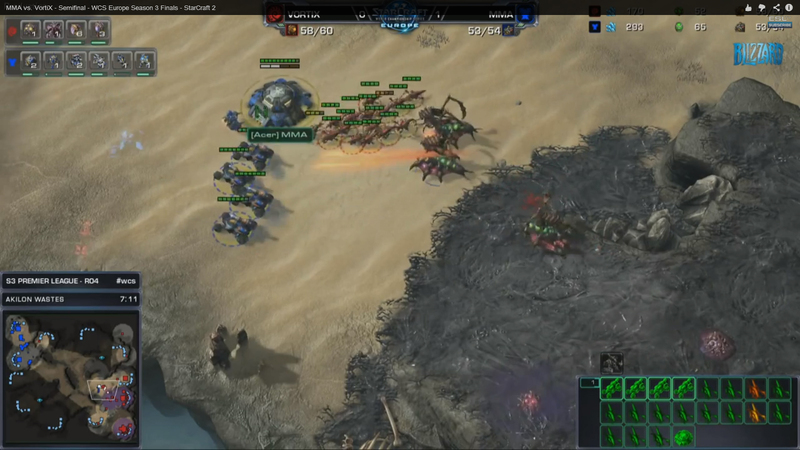 The second Reaper is usually parked right at the natural as a counter move to Zerglings which try to pick off the Scv that is building the command centre. In the game, MMA did not do that and sent the second Reaper to the farther tower. Then, moved it back to the nearer tower, while his first Reaper took control of the farther tower (4:50). 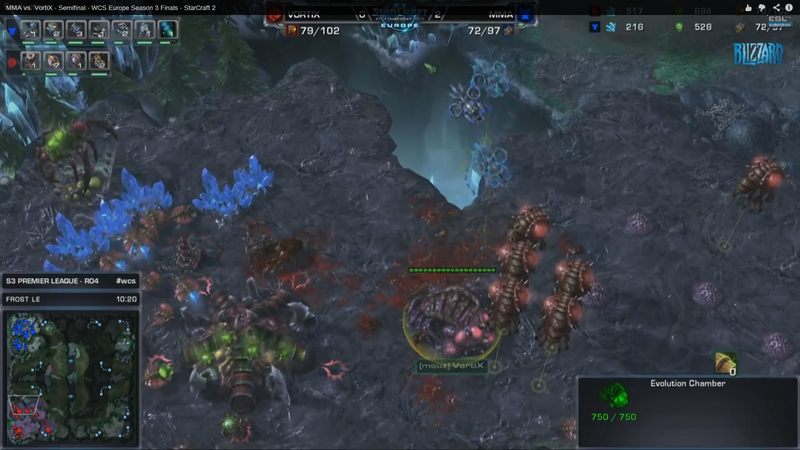 The two Zerglings did delay the command centre slightly since there was no Reaper at the natural. MMA transited into reactor Hellions, with a starport behind it. This was scouted by VortiX because there was no Reaper at the natural. 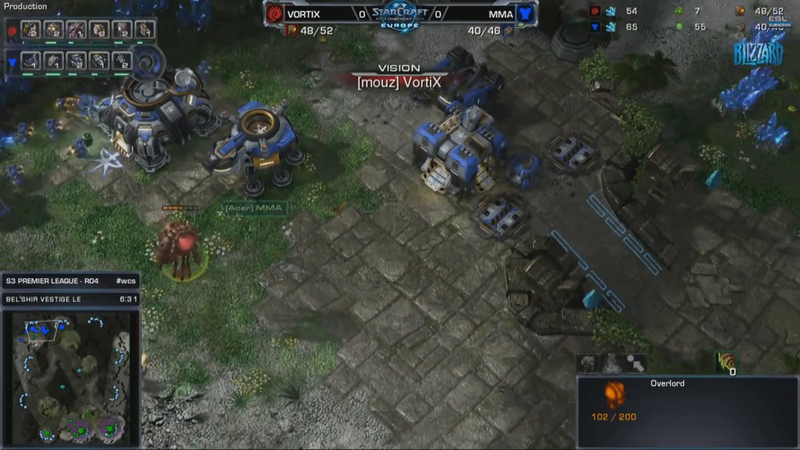 I am very sure that VortiX had studied MMA vs. Nerchio games prior this match. VortiX knew that Banshee was a possibility, and moved his Overlord to confirm it. On the other hand, MMA did not immediately put down a tech lab on the barracks after the reactor swap. He produced one Marine to kill the Overlord before getting the tech lab. Nevertheless, VortiX scouted that there was no tech lab on the starport. However, he still built spore crawler at the mineral line for safety. Viking was the first unit that was produced from the starport. Polt was the pioneer of getting an early Viking with a 12/12 Reaper opening. The purpose is to have map control. MMA had improved this build further by lining it up with a Medivac drop stim timing. He researched stim on the tech lab, and built another barracks. The second barracks was swapped onto the reactor. The starport produced two Medivacs (one at a time) and the factory produced a Widow Mine. When the two second Medivac was done, he loaded the bio and Widow Mines for the drop. VortiX did not know this was coming because the Viking cleared the Overlord. MMA even parked his Hellions at the tower to cover the Medivacs movement. Now recall the Reapers that controlled the two towers earlier in the game. They spotted for Overlord that the Viking needed to clear. Everything was planned. The attack lined up very well with the stim upgrade. The drop attacked the main, while the Hellions attacked the third. Brilliant. MMA was tactical about his drop with bio and Widow Mine through out his TvZ games. He would move the bio and Widow Mine in two different directions. 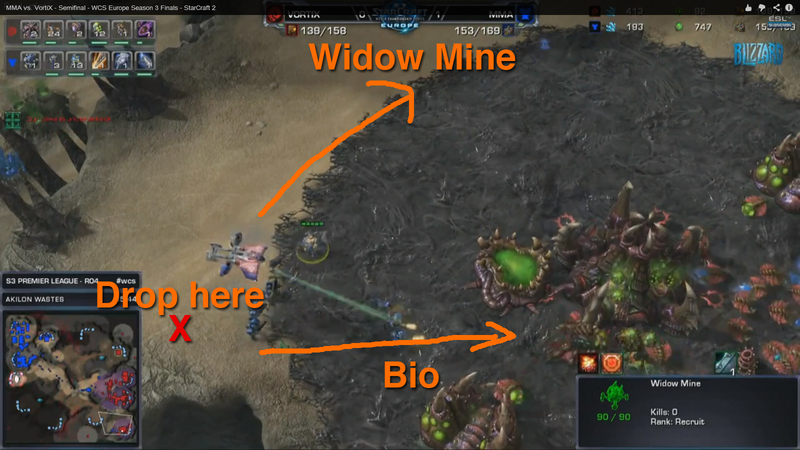 The bio moves to the attack target (building or Drones), while the Widow Mine moves to the location where Zerg will send units to defend the drop. 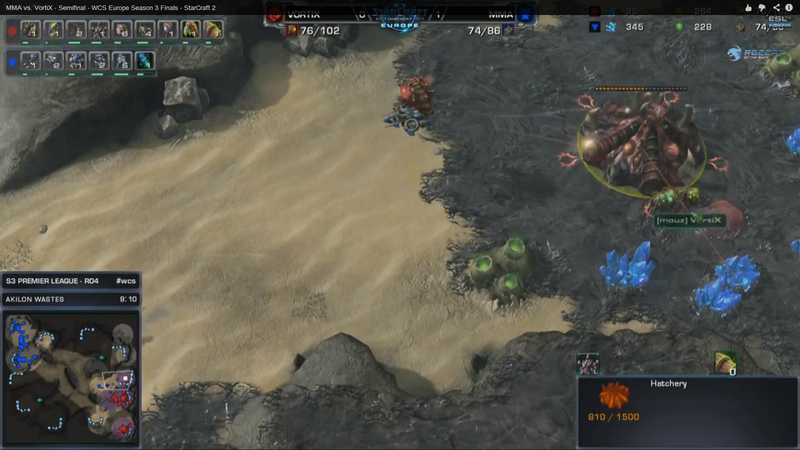 The Widow Mine is likely to connect with the Zerglings that are running towards the bio. If the Widow Mine landed a good hit, the bio can clear away the left over Zerglings. 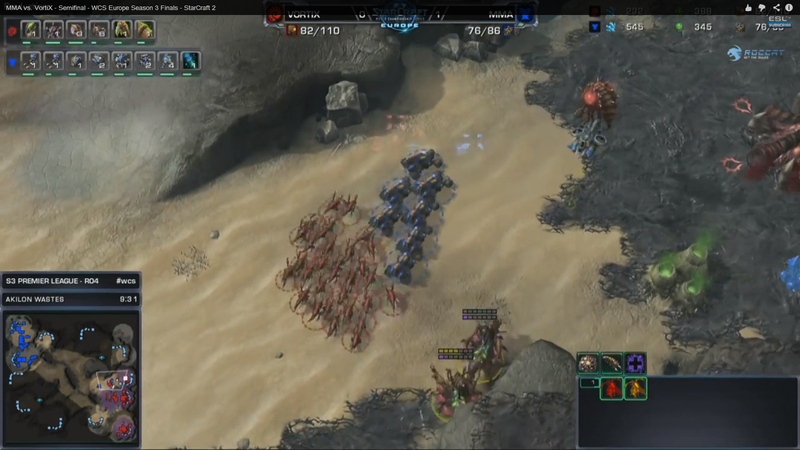 Then, the Zerg has to send a second wave of units to defend the drop. In the mean time, the bio is doing damage and there is another attack elsewhere too (e.g., the third). This is more effective than running everything to the attack target. 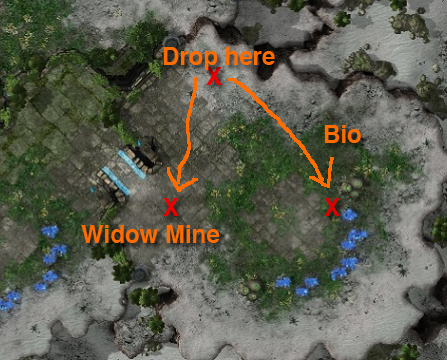 If the Widow Mine follows the bio to the mineral line and burrow there, it is less likely for the Widow Mine to land a good hit. This is because the Zerg player’s attention is right on the bio. MMA could afford to move both Reapers across the map because it is hard to sneak Zerglings out on this map. He built a bunker right at the exit of the natural to deny creep. Similar to other games, MMA went for a starport follow up. In line with the forward bunker, MMA used his Hellions to control the exit of VortiX. That location is crucial to everything. 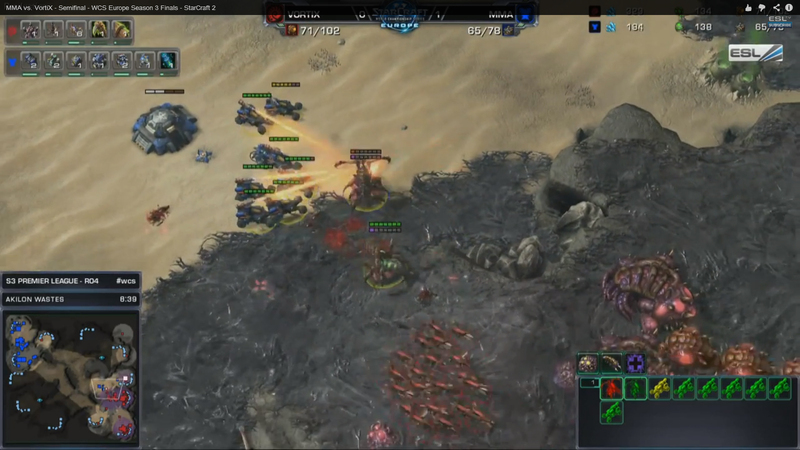 Zerg cannot move any units across to the Terran side. The reinforcement to the third is also affected. Pay attention to the production tab on the above image. MMA didn’t stop at the 3rd pair of Hellions. He produced a seventh Hellion and a Widow Mine. This gave him even better control at that specific location. MMA did not get an earlier second gas like he did with a starport follow up in other games, as he did not plan to get early Medivacs or cloak. He only produced one Banshee to pile the pressure on the third hatchery. Everything converged to the main purpose of that forward bunker: control that key location. The contain ended when MMA lost the Hellions because he was tempted to attack the Queens that were moving to the third. Very well played by VortiX. It was such a small window. Just like other games, MMA eventually converged to the standard macro game set up. MMA did not poke the front but chose to drop in VortiX’s main after the contain was over. This was because MMA did not have Widow Mines and Hellions that allow him to attack from the front. VortiX delayed his lair because he had to spend resources to break the contain earlier. Thus, there would not be Mutalisk in play at that time frame of the drop. The drop should not achieve much, but it was better than just parking the units at home. MMA joined up his army when he had a few Widow Mines to attack from the front. When MMA attacked the front, he also dropped VortiX’s main. Typical of MMA multitasking. He mixed one Widow Mine in the Medivac for the drop. 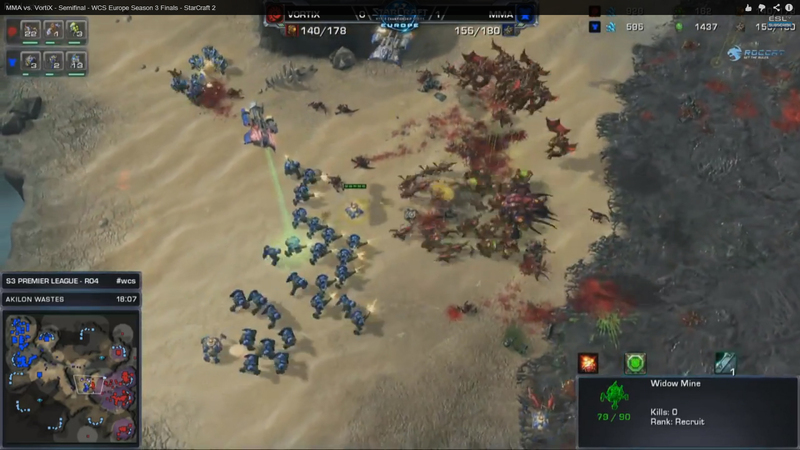 There was a period of time when INnoVation popularized Widow Mine + Marine drop against Zerg. Surprisingly, it died off after a while. 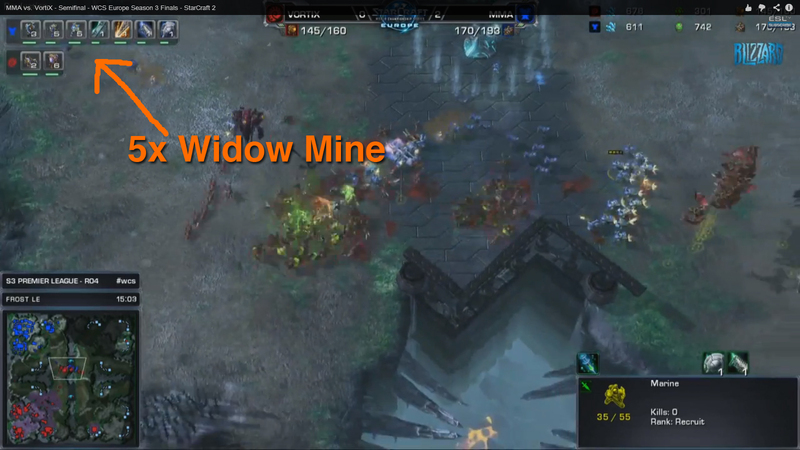 Anyway, MMA demonstrated how to drop with bio and Widow Mine. The effect of the early game contain was obvious in the midgame battle when VortiX often did not have the creep advantage. The trades were almost always in MMA’s favor. The outcome could be different if the creep spread was one to two creep tumor farther. 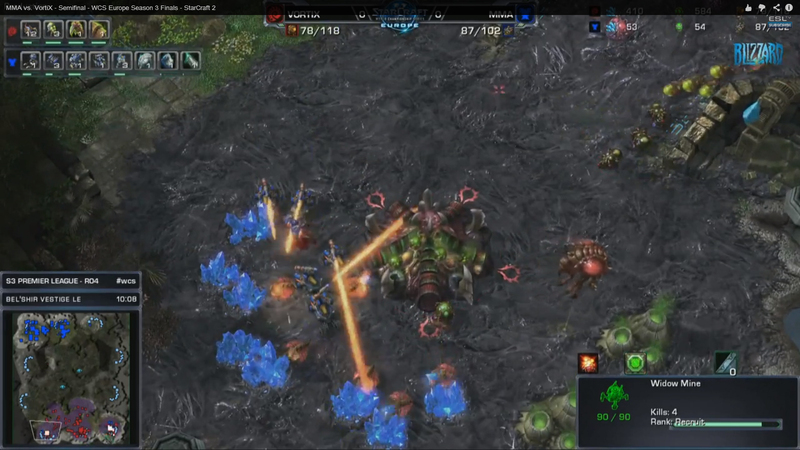 MMA went for a Hellion and cloaked Banshee follow up in this game. Just a side note: The second refinery has to go down when the factory is still building for cloaked Banshee transition. If you do not want cloak upgrade, get the second refinery when starport is building. MMA went up to three Banshees. The composition could work very well if he did not loss the Reapers and Hellions. I am surprised to see three factories. You usually get two factories for Widow Mines. This is an adaptation to the current TvZ metagame. Recently, Zerg’s win rate against Terran has increased because of the Overseer patch. Overseer and Mutalisk can snipe Widow Mines very well, and this results in a tipping point whereby Zerg will overrun Terran when the Widow Mine count drops. The third factory is to ensure there is enough Widow Mine to cover the bio even if the Mutalisks are actively sniping them. 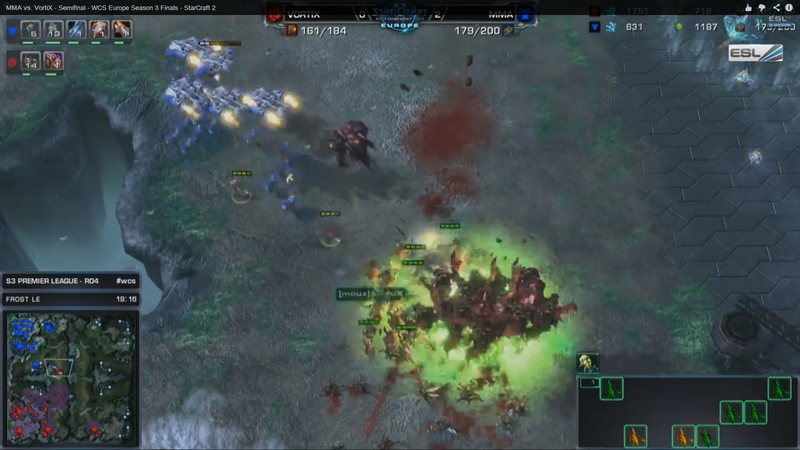 VortiX suffered from some good Widow Mine hits because he underestimated the number of Widow Mines. MMA Played brilliantly in each of his matches. It was a brilliant sight to see. Seeing him win after so long was just nostalgic. Reminded me of the Blizzcon 2011 finals (and the speech afterwards). 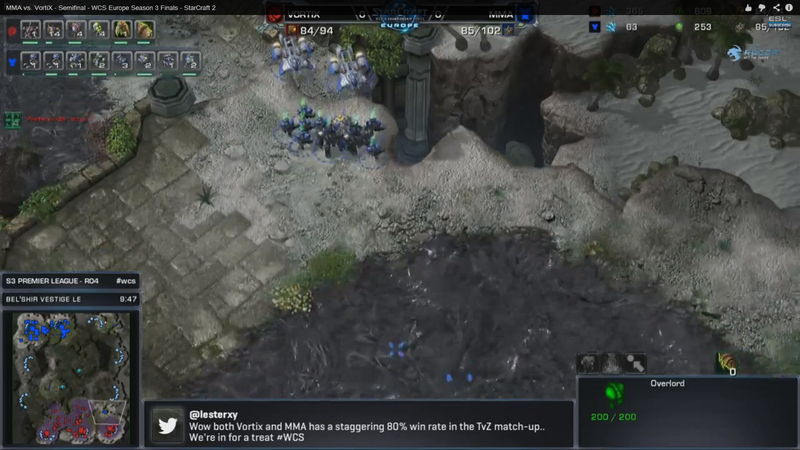 Ah the height of SC2, with all this talk of SC2 dying off is making me depressed (even though I dont believe it is). I think the “SC2 dying” thing is more of a system problem than a game problem. 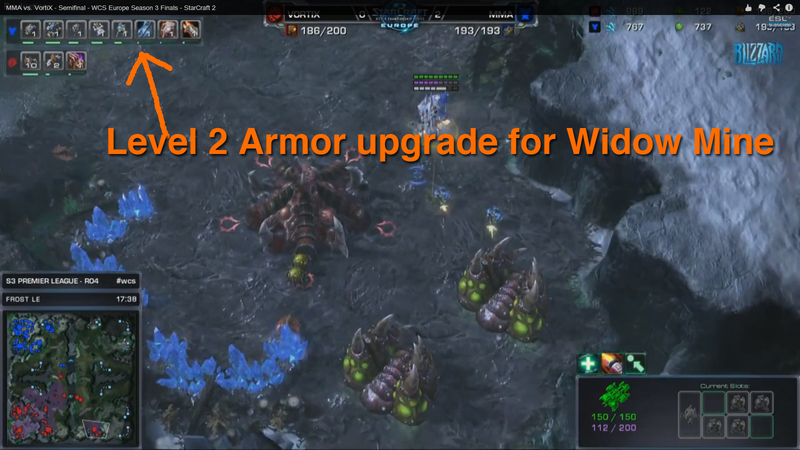 I am interested in how Blizzard improve WCS in 2014. Yeah, since season 3 premier league does not allow players to get seeds for WCS 2014 season 1, it would be interesting to see what changes blizzard has in store. Personally I think region locking and even residency requirements are bad for the overall competitive scene. I think it should be based on team residency. A player of any nationality should be able to play in a region as long as his team is registered in that region (and maybe has a team house or other infrastructure in the region). That puts the burden of responsibility on the team to participate and grow the scene as an organization, instead of putting all of the burden on the player who may not have the resources to compete in the tournament in the first place. Its just a thought. I could be way off point here, so I apologize in advance. Has it been confirmed that the seeding system does not carry over to 2014? I heard rumor about it, but I’m not sure. That will be huge.